EBRD finances the development of gold mining in Turkey – Tümad Madencilik A.Ş. The bank provides 40 million € credit for financing the activities that are required for the construction, improvement and operation of the two mines in northwestern Turkey –Lapseki mine in Çanakkale and İvrindi mine in Balıkesir. These two mines are under development by Nurol Holding, a group of companies in Turkey and by Tümad. 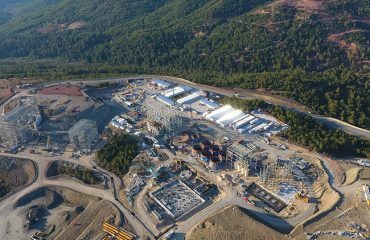 The company is among the first local capital private investors that will start a gold mine in Turkey. Turkey is the largest gold producer in Europe and the Mediterranean and is among the five largest gold exporters worldwide. The investment by EBRD supports the highest international standards in mining in addition to the best applications in the field of occupational health and safety, environment and social management. Tümad has devoted itself to taking international certifications in the fields of occupational safety, chemical management, social responsibility and code of business conduct. In the meantime, the investment will also create new employment opportunities in the region especially for young individuals. Tümad plans to provide education and employment opportunities to the population in the region. The company will build the first vocational high school of Turkey on mining technology in Balıkesir. In addition, it will also start an on-the-job training program in cooperation with the Mining Engineering and Geology Departments of Çanakkale 18 Mart University and Balıkesir University which will become part of the official curriculum starting from September 2018. In addition, Tümad will be a part of the high level government institutions and large establishment supported by EBRD which aim to increase work based learning opportunities, developing standards for occupational skills, increasing the testing of skills across the country while supporting career guidance for young individuals. EBRD Director of Natural Resources Eric Rasmussen has said: “We are pleased to cooperate with Tümad in the execution of the best applications in the mining sector as a result of its development of two gold mines in Turkey. We believe it is very important that the company aims to play a leading role in improving the skills of young individuals for meeting the demands of the labor market in a time when unemployment among young individuals is on the rise”. Nurol Holding Executive Board Member added: “We are pleased to have included EBRD among Akbank and Ziraat as the current strong partners of our group. Tümad and EBRD have been cooperating for over two years in order to ensure that our first gold mines reach the desired technical, environmental and social standards. The expertise of EBRD has gained significant importance for us as we entered the mining business”. The credit provided by EBRD is part of the larger financing package of 200 million USD provided by Akbank and The Republic of Turkey Ziraat Bank as the parallel credit institutions. EBRD continues to work in order to provide additional financing for the two mines. EBRD is an institution that makes significant investments in Turkey. Until now, it has made over 9,5 billion € of investment almost all of which was made to the private sector. In 2017, the bank has signed over 30 projects with a valuation of 1,2 billion € and it is expected that the investments will exceed 1,5 billion €.